The next time you see a deer, elk or cougar while driving over Snoqualmie Pass on Interstate 90, don’t just take a photo with your cellphone and post it to Facebook. Instead, consider assisting a conservation effort by reporting the sighting to the Western Transportation Institute. That’s what West Richland’s Keith Butvilas did when he came upon a dead elk calf on the side of the road. Soon after seeing the foundation’s billboard near Cle Elum, he noticed the dead animal, logged on and filed a report. 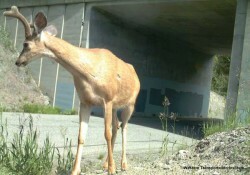 The institute is a part of the I-90 Wildlife Bridges Coalition, a nonprofit working with the Washington state Department of Transportation to create wildlife crossings over and under the freeway. And the group wants your help. I-90 Wildlife Watch, via its website i90wildlifewatch. org, seeks data from motorists who see wildlife — living and dead — on the roadway or nearby within a 40-mile stretch from near North Bend to Easton. Motorists are urged to complete their drive, then log onto the site to record what type of animal they saw. There are pictures to help identify the beast. The form also asks for location, if it was alive, how many there were, time of day and level of visibility during the sighting. Reported sightings included cougars, bears, skunks, deer — and Sasquatch. There always is a concern about how truthful people are, but most of the reports are considered valid based on the amount of information they offer. With almost 20,000 people in vehicles crossing Snoqualmie Pass daily, the wide range of reports has been valuable. The Western Transportation Institute is gathering data to help WSDOT learn where most of the mid-to-large sized mammals congregate and attempt to cross the roadway. Once the data is collected, it will be used to help not only determine where to create wildlife passages, but also help in the future to know if the crossings are making a difference. There also will be animal fencing to herd wildlife toward the crossings. WSDOT is building the crossings as part of the major renovation work going on at the pass. Fourteen areas within the project area have been identified for crossings, and there already are animal crossings in place — including one near Gold Creek. It is a state-funded project through the transportation partnership account, which is a $551 million project to remove the snow shed, put in new bridges and widen I-90. The Western Transportation Institute designed similar programs throughout the country, including in Colorado. Among the most successful crossings established are on the Trans-Canada Highway through Banff National Park in Alberta. “I think we’ve all seen the benefit of increasing public awareness regarding wildlife on the roadway,” MacKay said. “A lot of people have been really concerned about wildlife on the highway (on Snoqualmie Pass), and programs like this give them a place to go and report their information. The program is scheduled to run three years, and while WTI hopes it serves as a model for other areas in the state, there are no plans to implement it elsewhere.